Unless you are Colonel, and I’m pretty sure he can’t use the Internet. It would totally wig him out. 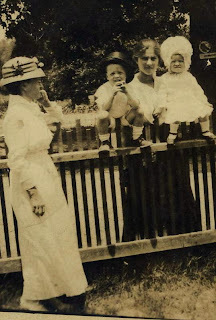 From left to right- Grandmother (Colonel’s mom) Colonel (totally squatting on the fence he fell off of- remember the “poisoned pup”), Aunt Hattie (dining hall picture) and Aunt Mary (squeezed my face). Isn’t this picture rad? And I’m telling you- Colonel and my sweet cousin Jake could be twins in this picture. Seriously, he looks JUST like Jake when he was a little kid. It’s crazy. Can you believe that is my grandfather sitting on that fence? Isn’t that wild? In this picture below, from left to right- Grandmother, Nannie Bernice (the baby in her arms-she died when she was 1), Grandfather (Colonel’s dad and doesn’t he look JUST like my Uncle John? 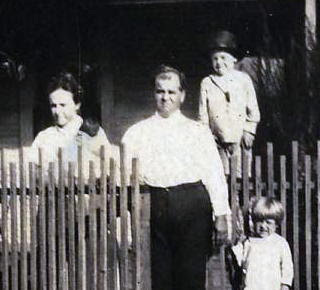 ), Colonel (again, on the fence rockin’ that Abe Lincoln top hat) and Aunt Mary Cool, huh? More totally old pictures tomorrow. I figure since Tatum and Sally (and my cousins Jake, Josh, and Julianne) didn’t get to come on this trip, I’ll show them what they are missing. Speaking of them, I’ve decided this- I want to remember Ma and Colonel. I want to remember Aunt Dickie (we’re with her in Texas now- she’s Colonel’s baby sister) and her family. I want to remember my parents and my parents’ siblings and their families. I don’t think that families have to have a designated “Rememberer”, and I hope we all enjoy the pictures and the stories. But I’m not willing to let the people in these pictures disappear…. except maybe Aunt Mary. She made me mad. But in general :), these people are worth remembering. They made me. They are the interesting and smart and funny… all things in me. 🙂 Ha. I’m the oldest grandchild on this side, and I think I’m ready to walk in what that means. So to my sisters and cousins, I promise I’ll step up when I need to. Christmas at my house (once Mama gets too old and snores during lunch). Okay? I love y’all. I’m grateful to my ancestors for pointing us towards God; I’m grateful to God for my ancestors. And after being serious so far, I couldn’t resist putting this on here…. So is Carmel Booty kind of like Butterscotch Booty? Or Hot Fudge Booty? Not sure.